Love locks are a symbol of love and commitment. It is probably an ancient custom, which is believed to have originated in China – where lovers lock a padlock on a chain or gate and then throw away the key, symbolically locking their love forever. Around the world, cities from Moscow to Rome are filled with fences, bridges, and poles adorned with padlocks. Austria: In Vienna love locks can be found on the Erdberger bridge and in Salzburg, on the Mozart Bridge. Belgium: Love padlocks are attached to the Slot van "A" art piece along the Scheldt, not far from MAS Museum in Antwerp. There is room for 50.000 locks! Croatia: On the bridge at the beginning of the breakwater in Rijeka harbour and in front of the Museum of Contemporary Art in Zagreb. Czech Republic: In Prague, love padlocks can be found in Malá Strana district on a small pedestrian bridge over a sidearm of the Vltava in front of a water wheel. Padlocks have also started to appear at the Charles Bridge, attached to the ornamental rails and some sculptures. Denmark: Love padlocks are attached to the fence along the Bryggebroen, a pedestrian/bicycling bridge that spans Copenhagen Harbour. Finland: In Helsinki, love padlocks can be found on the pedestrian bridge from Meritullintori to Katajanokka. In Tampere they can be found on the Tammerkoski Rapids overpass. They have also appeared on the Theater Bridge in Turku and the Rönö and Keilankanta bridges in Kuopio. France: Love padlocks can be found attached to the Pont des Arts, Passerelle Léopold-Sédar-Senghor and the Pont de l'Archevêché bridges in Paris. 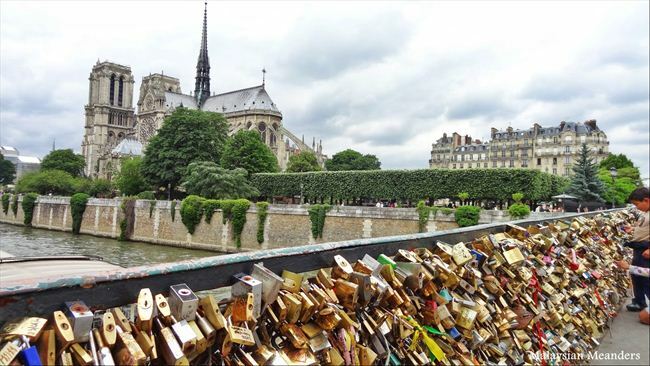 In May 2010, Paris Town Hall expressed concern over the growing number of love-locks, stating: "they raise problems for the preservation of our architectural heritage". 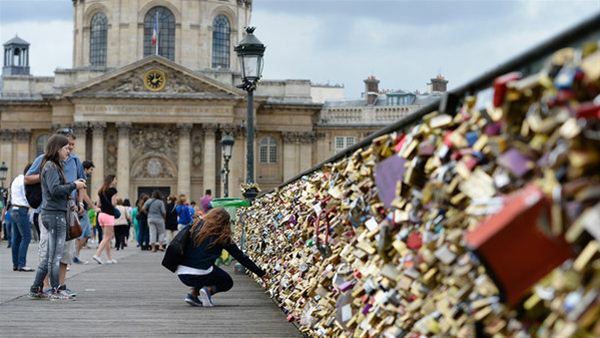 Lovelocks disappeared suddenly in 2010, but the Administration denied responsibility. The Pont de l'Archevêché saw the return of those love-locks immediately. 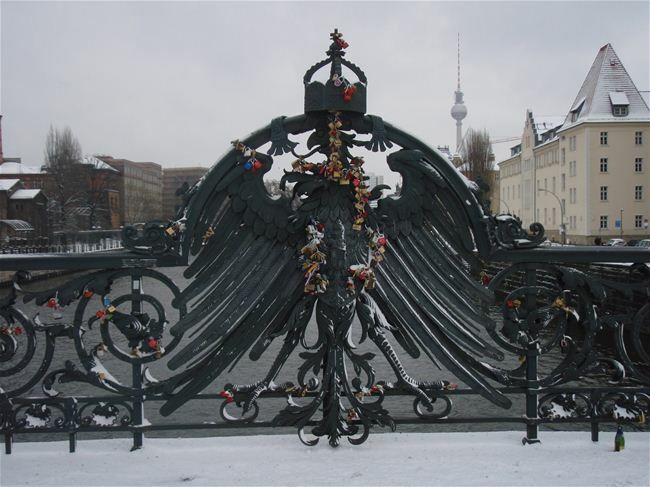 Germany: In 2009 love locks started appearing on the Hohenzollern Bridge in Cologne, Germany. Deutsche Bahn, the bridge's operator, threatened to have the locks removed, but relented in the face of public opposition. Love Locks have also started to appear on the Eiserner Steg Bridge in Frankfurt.The latest ones just opened in Lübeck, Regensburg , Munich and Stadthausbrücke in Hamburg. A small bridge along the Pegnitz river in the heart of Nuremberg is also the home to several hundred love locks. Locks have also appeared recently on the stone bridge over the Neckar River in Heidelberg. The couples find themselves in Berlin throw the keys together into the river Spree. Hungary: In Pécs, both students and lovers began to clamp padlocks to a wrought-iron fence in a narrow street linking the mosque in the city's main square and the magnificent medieval cathedral in the 1980s either as a symbol of the struggle to complete their study programme or a symbol of their commitment to one another. 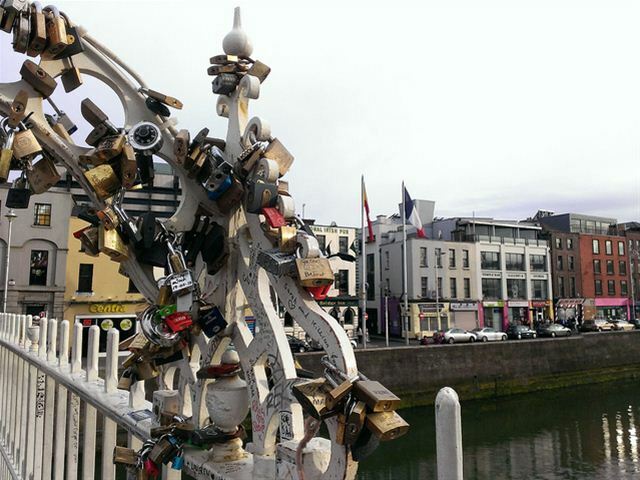 However, after the fence was completely covered and no more padlocks could be added, couples, both locals and tourists, began attaching them to fences and statues throughout the town center. On top of the mausoleum in Baja, Hungary, hundreds of love padlocks are attached. 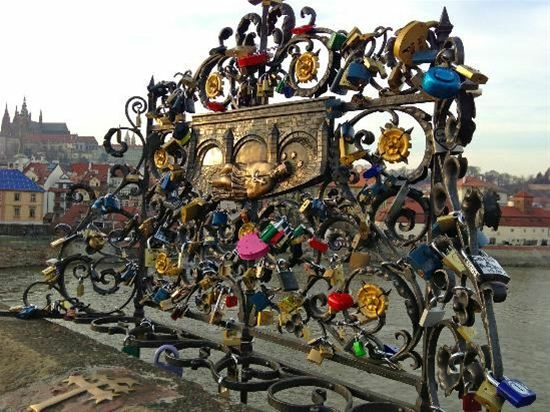 Probably encouraged by the example of Pécs, lovers of Miskolc, Hungary, have started to fasten padlocks on the fence of the bridge at Szinva Terrace in Miskolc, a city in the northern part of the country. Iceland: Several padlocks are attached to the Miðlína bridge on the Reykjanes peninsula. Ireland: Not officially a love lock bridge Ha'penny Bridge, Dublin. Locks are removed regularly to avoid damaging the 200-year old national monument. 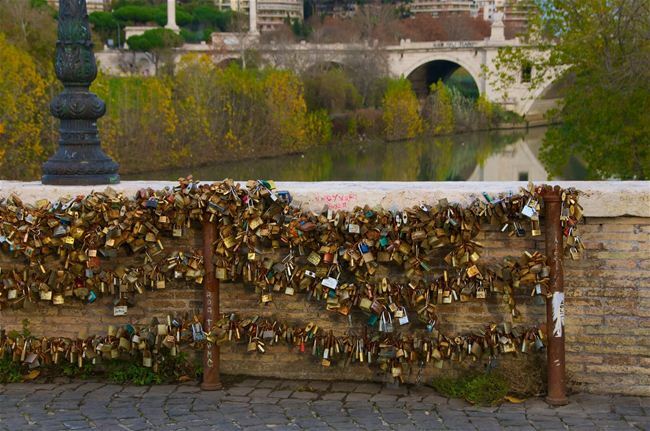 Italy: First starting at the bridge Ponte Milvio in Rome, the ritual of love padlocks has gained a significant presence in Italy, mainly inspired by a fictional event in the book I Want You by Italian author Federico Moccia. In Florence - Italy, love padlocks have been affixed to the railing around and near the statue of Benvenuto Cellini located at the centre of the Ponte Vecchio. In Bologna, on the Via Malcontenti. The same happens in Ventimiglia on the Passerella Squarciafichi between the old town and the new part of the town and in Turin, in several parts of the city. Perhaps the most famous example in Italy takes place on the Via Dell'Amore, a path connecting the towns of Manarola and Riomaggiore in the Cinque Terre. The pathway's legend holds that it was a meeting place for lovers from the two towns, and is now a favorite site for tourists to place their locks and throw the keys into the sea. Love padlocks are also attached to the Ponte Talvera in Bolzano, a short walk west from the South Tyrol Museum of Archaeology, in Verona on some of the bridges and also at 'Casa Di Giulietta', as well as in Peschici on the lookout over the sea near the castle. Latvia: Similar customs exist in Riga, the capital of Latvia, where married couples clamp padlocks on the railings of a bridge and throw the key into Riga city canal or river Daugava. Lithuania: Vilnius, the capital of Lithuania, has a bridge near Uzupuis where this tradition has been upheld too. Malta: Love padlocks are a new sight at the Sliema Strand where a small bridge at Tigné Point overlooks the historical city of Valletta, with its majestic 16th-century fortifications. 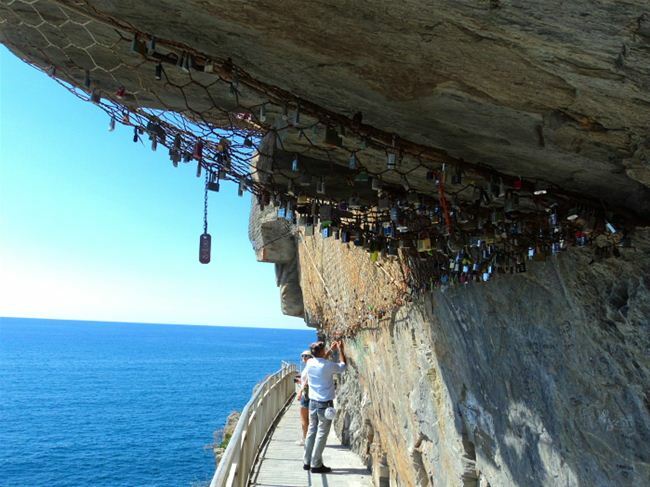 This romantic hotspot attracts both locals and tourists, who clamp padlocks on the railings of a bridge and throw its key into the Mediterranean Sea below to mark their undying love. Netherlands: Love padlocks are attached to the "Lock of Love" art piece in Delfshaven, a district in Rotterdam. The art piece by the Dutch art collective BLISS is a loveseat made of red painted forged steel in the shape of hearts. It is the winning design in a contest and was officially opened on Valentine's Day, February 14, 2010. Recently, people started attaching Love Padlocks to the Rijnhavenbrug in Rotterdam, between Katendrecht and the Kop van Zuid. And in Amsterdam some Love Padlocks are starting to appear at the Oosterdok bridge near NEMO. Poland: Love padlocks are attached to the Tumski Bridge over the branch of the Oder river in Wrocław, Lower Silesian Voivodeship and Kładka Ojca Bernatka in Kraków. The keys for the locks are mostly thrown to the river. Russia: In Moscow Padlocks have also appeared in Russia on iron bar Tree shaped structures. Most are placed by newlyweds on the Luzhkov bridge downtown Moscow. Serbia: The Most Ljubavi, meaning "Bridge of Love", is the location where love padlocks can be found. The bridge is in Vrnjačka Banja, one of the oldest spa towns in Serbia. 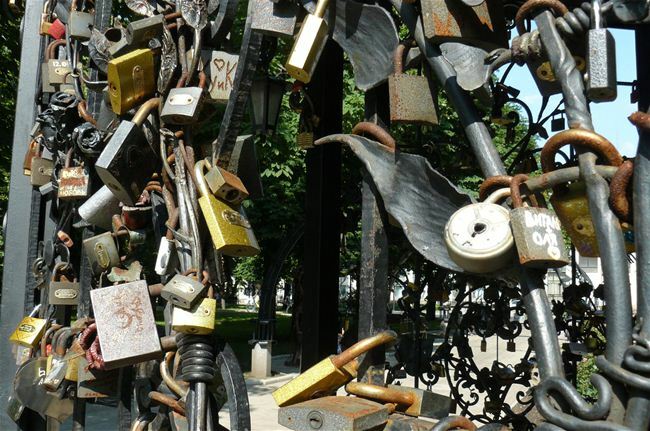 The history behind the love padlocks in Serbia can be traced to even before World War II. Nada, a local schoolmistress from Vrnjačka Banja, fell in love with a Serbian officer named Relja. After they committed to each other, Relja went to war in Greece, where he fell in love with a local woman from Corfu. As a consequence, Relja and Nada broke off their engagement. Nada never recovered from that devastating blow, and after some time she died, as a result of her unfortunate love. As young girls from Vrnjačka Banja wanted to protect their own loves, they started writing down their names together with the names of their loved ones on padlocks and attaching them to the railings of the bridge where Nada and Relja used to meet. Consequently, it acquired the name Bridge of Love. 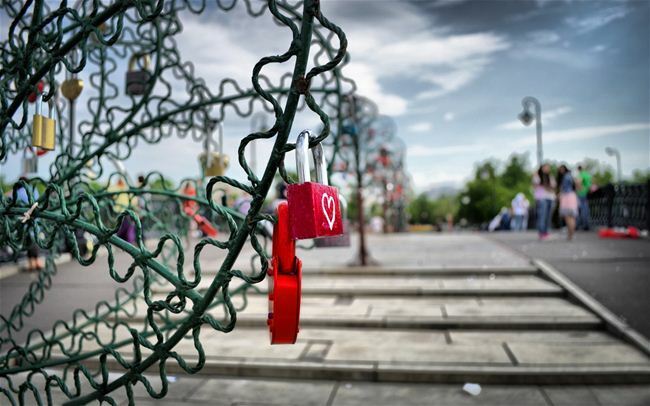 Slovenia: Love padlocks started to appear on the newly constructed Butcher Bridge, which connects the famous Josef Plecnik's marketplace with the opposite bank of the river Ljubljanica that runs through the capitol of Slovenia, Ljubljana. Spain: In Seville, padlocks were found adorning the bridge "Puente Isabel II" connecting the historic center of the city with the Triana, Seville neighborhood. However, they were taken down in 2009 due to the weight it was adding onto the bridge. The side of the bridge with the old locks is now under construction, while the other side is starting to get more locks from locals and tourists. Love padlocks can also be found above a well in Salamanca, Spain. Love locks have also recently been added to the statues surrounding the lake of Retiro Park in Madrid. A number of padlocks can be found at a viewing point below the Temple de Sagrat Cor at Tibidabo, overlooking Barcelona. Another site is Sa Palomera rock on the beach at Blanes on the Costa Brava in Spain. Sweden: In Stockholm love padlocks can be found on Västerbron, while in Jönköping love padlocks can be found on Munksjöbron. In Umeå a small number of locks can be seen on Notvarpsbron. Switzerland: In the center of Zurich, on the river Limmat, you'll find Mühlesteg Footbridge, a pedestrian bridge that connects Bahnhofquai and Limmatquai, where there are many love padlocks of various shapes and sizes. Romania: In Cluj-Napoca, on the Somes river, the Elisabetha pedestrian bridge is becoming a place where lovers lock their secret love. In Timisoara, on the Bega canal, the pedestrian bridge on Splaiul Nistrului, between Decebal and Michelangelo bridges is one of the so-called love-bridges. Ukraine: In Kiev love locks can be found on a pedestrian bridge over Volodymyrsky uzviz near the National Philharmonic building. In Odessa the "Mother-in-law" bridge, close to the sea port has many love locks along its length. England: In London, love padlocks are attached to various points along the fence on Tower Bridge and Millennium Bridge. In Southport (Merseyside) an unknown couple started the trend by attaching a love padlock to the suspension bridge. There are now quite a lot of locks on Liverpool's Albert Dock, and there is a sign up that states "This is a special place for lovers! Interlock your padlocks on the railings and throw away the key into the Mersey. You will never lose your true love!" There are also several love padlocks on the bridge across the river Wharfe in Otley. In Newcastle upon Tyne, love padlocks are attached to the east side of the High Level Bridge. The Coach and Horses pub in Kibworth, Leicestershire, has a LoveScape in its rear parking area, which has locks from celebrities such as Michael Wood. The site was dedicated in 2012 for the Queen's Jubilee. In the village of Martham, Norfolk there is chain-link fence in School Road that bears a number of these padlocks, and has done so for many years. A growing number of love padlocks adorn a metal chain-link fence at Braithwaite Street. There are a lot of these in Leeds, on the Centenary Bridge over the River Aire. Porthill Bridge over the River Severn in Shrewsbury has a number of love locks. Scotland: In Glasgow love padlocks are attached to the fence behind the skatepark in Kelvingrove Park in the city's West End. There has also been an attachment on the Forth Road Bridge, Edinburgh. There are also some on the foot bridge in Pitlochry. A small number can be found on a footbridge near Cargill's Leap on the River Ericht in Blairgowrie, also in Perthshire. More recently, these have also appeared in Ayr, South Ayrshire on Turners Bridge crossing the River Ayr.